Apartments & Rooms Vitt is set 70 metres from the centre of the city of Vis, on Vis Island. It presents air-cooled accommodation with either a furnished balcony or an outdoors terrace with a sea view. The pebbly beach is just 250 metres away. All units have private entrance and are fitted with a TV. Apartments and studios also comprise a kitchen or a kitchenette with a dining area. The closest grocery store and a dining establishment can be reached within 50 metres. In the centre visitors can arrange boat excursion to Biševo Island. Free car parking is possible in the proximity. Apartments & Rooms Safić ~0.1 km, Vis Apartments & rooms Safić is a self-catering accommodation situated in Vis. Some of the properties have sofa, a fan and air conditioning. At Apartments & rooms Safić you will find a back yard and an outdoors terrace. 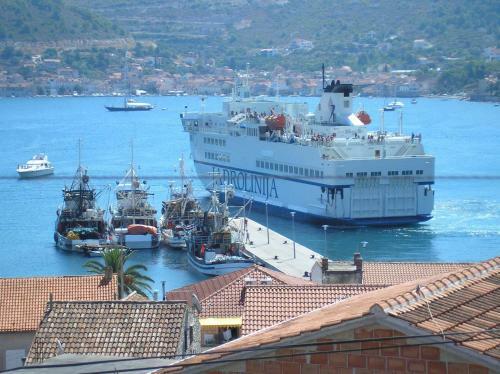 Apartments & Rooms Vitt ~0.1 km, Vis price per day from € 40 Apartments & Rooms Vitt is set 70 metres from the centre of the city of Vis, on Vis Island. It presents air-cooled accommodation with either a furnished balcony or an outdoors terrace with a sea view. The pebbly beach is just 250 metres away. All units have private entrance and are fitted with a TV. Apartments and studios also comprise a kitchen or a kitchenette with a dining area. The closest grocery store and a dining establishment can be reached within 50 metres. In the centre visitors can arrange boat excursion to Biševo Island. Apartments Zora ~0.1 km, Vis price per day from € 40 Please inform Apartments Zora in advance of your expected arrival time. You can use the Special Requests box when booking, or contact the property directly with the contact details provided in your confirmation. Milna (Vis) ( ~ 4.7 km ): 24+ apartments. Rukavac ( ~ 4.8 km ): 75+ apartments. Beach Prirovo ~ 0,5 km from Apartments & Rooms Vitt Gravel beach: ideal for families, recommended for young people, with restaurant, with caffe bar. Excellent choice of watersports. Beach Kalafatovo ~ 0,8 km from Apartments & Rooms Vitt Gravel beach: ideal for families, with caffe bar. Beach Parja ~ 0,9 km from Apartments & Rooms Vitt Sandy beach: ideal for families, recommended for young people. Excellent choice of watersports. Beach Stoncica, island Vis ~ 0,9 km from Apartments & Rooms Vitt Sandy beach: ideal for families, recommended for young people, with restaurant. Excellent choice of watersports. Beach Goveja ~ 1,2 km from Apartments & Rooms Vitt Gravel beach: ideal for families, with restaurant, with caffe bar, equipped with showers. Excellent choice of watersports. Restaurant Konoba Golub, Vis ~ 2,2 km from Apartments & Rooms Vitt Address: Podselje 12, 21480, Vis. Cuisine: Croatian cuisine. Restaurant Villa Kaliopa, Vis ~ 1,2 km from Apartments & Rooms Vitt Address: Vladimira Nazora 32, Vis. Restaurant Pojoda, Vis Guest reviews: 8,3/10 ~ 1,4 km from Apartments & Rooms Vitt Address: Don Cvjetka Marasovic 8, Vis. Prices: 196 HRK - 795 HRK. Restaurant Karijola Pizzeria, Vis Guest reviews: 7,6/10 ~ 0,9 km from Apartments & Rooms Vitt Address: 4 Viski Boj, Vis. Cuisine: Pizza. Restaurant Boccadoro, Vis Guest reviews: 9/10 ~ 1,4 km from Apartments & Rooms Vitt Address: Petra hektorovica 2, Vis.